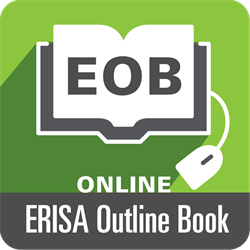 The ERISA Outline Book by Sal L. Tripodi, APM, J.D., LL.M. is both a reference book and a study guide on qualified plans. The Online Edition of The ERISA Outline Book is a fully searchable and cross-referenced website with all the Print Edition's information. ASPPA's online platform allows users to easily navigate the information, perform quick and advanced searches, take notes and bookmark content, copy, paste, and print easily, and even send content links to subscriber colleagues. Each Online Edition subscription provides 12 months of full access to the website.